Property 1: Spectacular apartment with huge terrace and panoramic views. Puerto Marina, facing the beach, in the heart of summer life, dream view !! Property 7: Puerto Marina, facing the beach, in the heart of summer life, dream view !! Cubo's Finca Micaela. Wifi, air conditioning, pool, parking, BBQ. Property 8: Cubo's Finca Micaela. Wifi, air conditioning, pool, parking, BBQ. Property 9: Luxurious apartment in best Triana-Sevilla pedestrian street. Wifi, AC. Sun Trap with amazing views. Suitable all the family with WiFii included. Property 13: Sun Trap with amazing views. Suitable all the family with WiFii included. Garnata Luxury apartment in Granada. Property 17: Garnata Luxury apartment in Granada. Property 20: Frontline beach super deluxe penthouse with private plunge pool !! Property 21: Peace and views in this off the beaten track chalet, set in the tabernas desert. New to market Luxury Apartment close to all amenities, great garden and BBQ inc.
Property 40: New to market Luxury Apartment close to all amenities, great garden and BBQ inc.
Property 41: Torremolinos:!HOLIDAYS ON THE SEA! Property 48: Summer at la Carihuela! We thoroughly enjoyed our time in this lovely apartment. 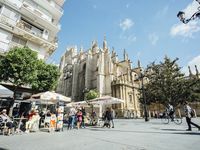 We love this corner of town as it has absolutely everything close at hand: cafes, restaurants, tapas bars, beach, seaside promenade, grocery stores, riverside promenade, and easy walk to the Balcon. Views of the sea and the beautiful mountains. The apartment is very well appointed, clean and bright with windows everywhere. Pictures online are accurate. Nice location at the end of the corridor overlooking the courtyard so you can open the door and get nice morning sunshine without anyone walking by. The balcony on the other side has mostly a mountain view with a slight sea view, both of which are beautiful. The owner is very easy to deal with and responds promptly to questions. We would recommend and plan to stay there again ourselves.